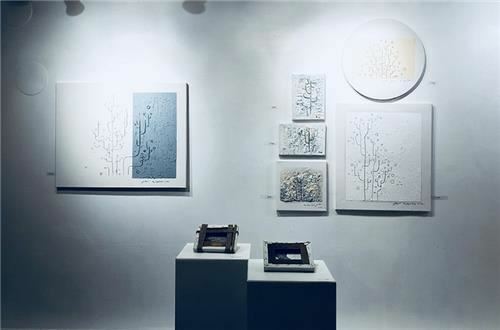 Actress Koo Hye-sun is holding an exhibition of her paintings in Paris until Nov. 16. "Koo has been holding a show with 'zero' as a theme," a spokesperson for Koo's agency, Partners Park, said Wednesday. "She is exhibiting 25 works that express deep emotions inside people, using abstract lines and colors." Exhibition visitors have given positive feedback, according to reports. Galerie 89 in Paris invited Koo. The Korea Fine Arts Association (KFAA) and Art Blue are co-sponsoring the show. Koo, who debuted in a TV commercial in 2002, is widely known for her versatility as an artist. Despite being an actress, she also has been working as a painter, film director and writer. In 2009, Koo held her first exhibition, "Tango" in Seoul, and "dark YELLOW" in 2017. Last year's show, which had innocence, horror and freedom as themes, was a big success. When asked about her motivation to get involved in diverse careers, Koo said: "I want to take out things that have been confined in me as I was forging an acting career."